I taught myself to can the year that I got divorced. My life felt a bit beyond my control, so I wanted something to do that would provide immediate results and distract me in the evenings after my kids went to bed. Though this skill had always intimidated me, some googling around and a great little book called Food in Jars persuaded me that I could probably manage to learn this skill. So I bought some fruit and some jars, and got to work. These days, I have a set of shelves in the basement that’s loaded with jams, salsa, and pickles. For me, that stash of deliciousness is plenty of justification for my hobby. But as with my other hobby — knitting — I occasionally run into people who cannot imagine why I’d take the time to can when grocery stores are able to provide me with delicious pickles and preserves for a fraction of the cost. Sometimes I explain myself by handing them a spoon and a jar of homemade jam. Sometimes, though, they need more of an explanation. For those folks, and for other canners who face the same questions, here are some of my answers. Canning is a consumption good. That doesn’t just mean that I consume the jams and pickles that I can. (Although I do, and they’re yummy!) It means that I take a lot of pleasure in the process of making jam, or in discovering that it’s possible to make pickled summer squash out of the overabundance that appears in my garden every summer. 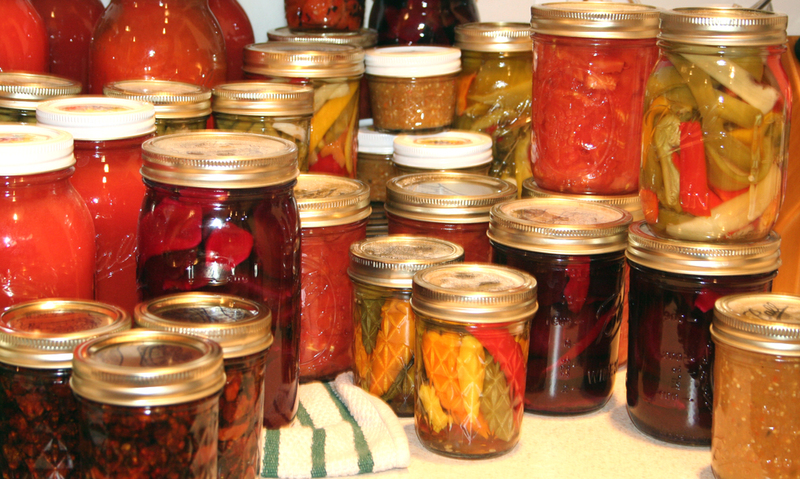 The time spent in the kitchen, canning food, is leisure time for me. I enjoy using it this way. I “consume” my canning time in much the same way that I’d consume time spent at a summer movie or tanning by the pool. It’s a sign of how wealthy we are as a society that we can think of canning as consumption rather than production. For thousands of years, preserving food during harvest seasons in order to have it during fallow times was a matter of life and death, not of leisure. Adam Smith knew this would happen. He points out in his Wealth of Nations that “hunting and fishing, the most important employments of mankind in the rude state of society, become in its advanced state their most agreeable amusements, and they pursue for pleasure what they once followed from necessity.” Or, as economist Steve Horwitz has pointed out, “We’re rich enough to play at being poor.” Like knitting, or having backyard chicken coops, or camping, canning food is a pleasure that used to be a necessity. Though I know I’m only doing it for fun (and for an endless supply of jam for my morning toast), I also like the feeling of independence that canning gives me. With fairly regular governmental attempts to crack down on such insidious and detrimental practices as front yard vegetable gardens, rainwater collection, and urban composting, canning my own food at home — especially if I grew it in my own garden — feels just a little rebellious. The liberty revolution won’t plant its flag on a barricade built of pint jars, but it’s fun, every once in a while, to imagine that it might. While I don’t homeschool, I do appreciate the opportunities that canning has offered for exploring a whole range of intellectual questions and pursuits with my kids. We have learned what makes jam gel and what to do when it doesn’t. We have explored flavors that go together well and badly. We have talked about the fallacy of composition as a way to explain why blueberry jam is great, and dill pickles are great, but blueberry and dill pickle jam is awful. We do math every time we double a recipe or divide our pickling spices among three jars. We talk about the importance of not wasting food, of eating things that are healthy and delicious, and of cooking for people we love. Perhaps most pleasurably, canning gives me the chance to nurture the intimate order, the “micro-cosmos” that Hayek contrasted so usefully to the macro-cosmos of the marketplace. My daughters and I are building memories and creating family stories whenever we preserve food together. I always have a gift on hand to bring to a friend or to a sick neighbor. The girls have apple and honey jam to give their teachers for Rosh Hashanah. And every time we do those things, we strengthen the bonds that make communities worth having. If you have canned, you know that it takes a surprising amount of fruit to make a fairly small amount of jam. Three pounds of berries and five cups of sugar produce just three small jars. But there’s a lot more in that jar than fruit. And I get a lot more out of it. This blog post has been reproduced with the permission of the Foundation for Economic Education. The original blog post can be found here. The views expressed by the author and the Foundation for Economic Education are not necessarily endorsed by this organization and are simply provided as food for thought from MomThink.